e-Manifest | SET Environmental, Inc.
EPA is establishing a national system for tracking hazardous waste shipments electronically. This system, known as “e-Manifest,” will modernize the nation’s cradle-to-grave hazardous waste tracking process. EPA anticipates launching e-Manifest on June 30, 2018. Use of the e-Manifest system is optional starting June 30, 2018. EPA has established incentives to move manifest user from the paper manifest to the e-manifest system (e.g., lower submission fees for e-manifest use, hybrid e-manifest and phase out date of June 30 2021 for paper submissions to EPA). 2001 - EPA’s initial proposal to transition from paper-based to electronic-based reporting. Who is the e-Manifest For? Manifest data will be made available to the public 90 days after receipt by the receiving facility. No claims of Confidential Business Information (CBI) are allowed except for data associated with Department of Homeland Security (DHS) Chemicals of Interest (COI) that are listed Commercial Chemical Products (CCPs) (i.e., P and U-Listed waste). E-Manifest system includes all the information currently required on paper manifests. However, all RCRA waste codes can be included in the system rather than just 6. State waste codes will be accepted by the e-Manifest system. Each line item will have its own section 14 additional information. e-Manifest templates can be saved and repopulated for similar shipments at a later date. Manifest tracking number is issued by the e-manifest system. How is SET Environmental preparing for e-Manifest? SET is in the process of programming our Manifest system to create e-Manifests for our customers. On April 25, the EPA announced they were delaying certain key functions of the e-Manifest system: manifest data corrections, the ability to sign on behalf of the generator and Broker access (i.e, allow SET to generate e-Manifests for our customers). They anticipate the ability to sign on behalf of the generator and broker application to be in place late this summer. The e-Manifest correction application is anticipated to be in place later this fall. Until the Broker process flow is completed and opened for tested, SET will comply with this new program by electronically submitting manifest information to the EPA using data file uploads with manifest images for all waste received at our Houston TSDF. We will follow existing work for customer manifest generation for shipments. Once the EPA Broker system is open for testing SET Environmental will register all responsible SET personnel to ensure that the generator is able to utilize e-manifest if they choose to do so. As EPA finalizes the registration process, SET Environmental will provide our customers with instructional information to aid in registering. Although e-manifest will not generate Land Disposal Restriction Notifications or shipping labels, SET Environmental will continue to provide these documents and labels to our customers. All entities utilizing e-Manifest must obtain an EPA ID Number using EPA Form 8700-12 (e.g., a broker creating a manifest for a customer or a non-hazardous waste receiving facility). Initial registration is a two step process requiring agency approval. Final step after registering as a Site Manager or Certifier is to obtain an Electronic Signature Agreement in order to sign manifests and make corrections. Site Manager Can register other users at their facility. This user is required to obtain an Electronic Signature Agreement. None The user has no permissions for these sites within the module specified. Viewer The user can view data for these sites within the module specified but cannot change the information in any manner. Preparer The user can enter data for these sites within the module specified but cannot sign and submit the information to the regulatory authority. Certifier The user can sign and submit the information for these sites to the regulatory authority. This user is required to obtain an Electronic Signature Agreement. EPA recommends having at least two individuals assigned to this role. 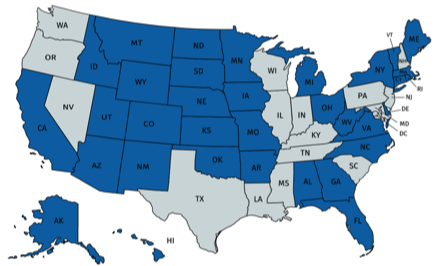 Role is currently available in states that have opted into either MyRCRAid (electronic registration) or Biennial Reports. If you have already registered with the site manager role in these two program areas, you will automatically have that role in the e-manifest application. Site Manager Role will be available for e-manifest in all states well before system launch. When the system goes live, it will be live in all states at the same time at the federal level. e-Manifest applies to hazardous waste as well as State regulated waste required to be manifested by the generating or receiving state. Manifest data is required to be submitted by the receiving facility to the USEPA within 30 days of waste receipt. This applies whether or not the generator uses the e-Manifest system or paper manifest copies. Manifest data will be retained by EPA indefinitely. Use of the e-manifest satisfies any requirement to obtain, complete, sign, provide, use, or retain a manifest. Receiving facilities are required to complete the manifest for non-hazardous waste even if the waste is not regulated in the destination state. The generator is required to verify that all entities identified on the manifest can e-sign prior to shipment. Each individual within an organization must register in order to create and sign manifests (e.g., each driver in a transportation company). The e-Manifest is populated by an agent for the generator. ▢ All other parties identified on the manifest then sign electronically. ▢ An offeror such as the initial transporter that performs pre-transport functions (e.g., Package Marking. and Labeling, Preparing a Shipping Papers). See 49 CFR 171.1 for a list of pre-transportation functions. Neither the generator nor the receiving facility may sign on behalf of the transporter. After registering at RCRA info for e-manifest use, the generator will be able to track the movement of their waste from transporter 1 to transporter 2 (if applicable) then to the receiving facility. The generator will no longer receive, by mail, a signed copy of the manifest from the receiving facility, unless a paper manifest is used. In the case of hybrid e-manifests, if the generator has not registered in the e-manifest system, they need to make arrangements with the receiving facility to return a hand signed manifest. As long as manifests are readily available for viewing and production if requested by any EPA or authorized state inspector. Final copy signed by the receiving facility. Other documents (e.g., LDR, weigh tickets) will not be maintained in the system. States cannot require the submittal of e-manifest copies from the generator or receiving facility. If paper manifests are used, manifest retention by the generator and transporter is performed the old fashion way. However, if the generator has registered in the e-Manifest system, they can utilize the scanned image of the signed paper copy uploaded into the e-Manifest system by the receiving facility to satisfy record keeping requirements. Only the final copy, signed by the receiving facility, will be maintained for viewing in the e-Manifest System when paper manifest copies are used. States can require submission of the generators initial copy, if paper manifests are used. What if e-Manifest becomes unavailable? The generator is not liable for the inability to produce an electronic manifest for inspection, if due exclusively to a technical difficulty with the e-manifest system for which the generator bears no responsibility. Paper manifest rules apply thereafter. If e-Manifest is used, a paper copy of the manifest must be printed and retained as required by the carrier to comply with DOT. Within the drivers reach while restrained by a seat belt. On the driver’s seat or drivers door pocket, when the driver is not in the vehicle. Placed on top of non-hazardous material shipping papers or otherwise tabbed to distinguish them. These rules also apply to emergency response information maintained with the manifests (e.g. North American Emergency Response Guide). Manifest corrections may be made before the initial transporter signs the manifest or after the receiving facility signs the manifest and submits data to the EPA. Corrections can be made by any individual identified on the manifest and state regulators. Electronic notification of corrections must be sent to all parties identified on the manifest. The last correction made is regarded as the final and correct representation of the data. Certification that corrected data is accurate and complete is required. There is no time limit on data corrections. Contact the transporter and/or receiving facility, if the receiving facility has not e-signed the manifest within 35 days of the first transporters signature. Submit an exception report if not e-signed by the receiving facility within 45 days. E-manifest will be accessible by computer and mobile devices such as tablets and smart phones. The generator, transporter and receiving facility may utilize each other’s equipment when the transaction is made; however, each entity must login under their own account to e-sign. Where an electronic signature device/code is used to create an individual's electronic signature, the code or mechanism must be unique to that individual and only they are entitled to use it. There will be a new paper manifest for use on and after June 30, 2018 when not utilizing e-Manifest. The 5 Page form replaces the 6 page form due to changes in distribution. Page 1 and 2 are merged into Page 1 for submittal to the US EPA (i.e., State submission copies have been removed). Page 1 Designated facility to EPA (top copy), - replaces destination and generator state copes. Obsolete 6-page form may continue to be used with caution. If the obsolete manifest is used, page 1 is sent to the EPA. EPA has recommended to cross out …TO DESTINATION STATE (IF REQUIRED) and enter …EPA (i.e., DESTINATION STATE TO EPA). User fees will be paid by the receiving facility. There are no additional fees for corrections or continuation sheets. Fees will be updated at two year intervals and published online by June 1 of each odd numbered year. The updated fee will account for shortfalls realized in the previous two years. Final fees have been established 7/2/2018. Subscribe to the general interest e-Manifest ListServ by sending a blank message to: eManifest-subscribe@lists.epa.gov. Subscribe to the development-focused e-Manifest ListServ by sending a blank email to: e-ManifestDev-subscribe@lists.epa.gov.